Now usually every Sunday, we try to bring some humor into your weekend, but once in a while, we must use this opportunity to discuss something a little more important. Today is one of those occasions. An astute reader send me the following jpeg. Just what do you readers think? Then I looked closer and noticed a couple of things. 1. 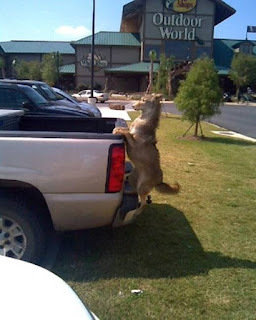 That is not a dog, but a coyote. 2. That is a STUFFED coyote! Click the image to enlarge and you'll see what I mean. The pose, while physically possible, is not natural for a coyote. While that is the "stand on your hind legs and hope for a treat" position some dogs use, coyotes don't beg. They take. Especially the wild ones. Besides, if the coyote, for whatever reason, was trying to climb into the back of that vehicle, its respective front and back paws would not be uniformly positioned. One of each set would be ahead of its mate trying to find a good toehold to continue climbing. Now I honestly have no idea of the back story leading into this situation, but can you imagine driving down the road and seeing this in front of you? Some jokes just don't live up to the adjective "practical". Jumping out from behind something to surprise someone you haven't seen in a while I can understand. But to something like this...? Okay, not every installment of the Sunday Funnies can be a winner, but this is just something I had to get out of my fur and deal with. Meanwhile, we'll be back next weekend with something hopefully more entertaining than this.